← How Can I Stop My Hinges From Rusting? The Chameleon Pro Handle is the perfect retrofit solution for any uPVC door. 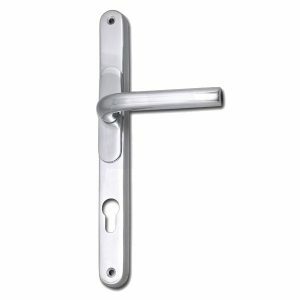 The handle has an adaptable height and screw centres allowing the handle to suit lock centres between 59-96mm. The handle can be used both internally and externally on uPVC doors and comes in a range of beautiful finishes, including polished chrome and polished gold. To find out more about the application and instillation of the Chameleon Pro Handle, call our technical team on 0207 099 2822 or email info@doorstuff.co.uk. This entry was posted in door handles and tagged adaptable door handle, chameleon pro, polished chrome, polished gold, product spotlight, uPVC door. Bookmark the permalink.